Meanwhile, the governor took the stage to point his finger at House Speaker Mike Madigan, saying he "picked a fight with the wrong guy"
Opponents of Gov. Bruce Rauner's proposed state budget cuts rallied outside of the Illinois State Fair Wednesday during the fair's annual "Governor's Day." As Rauner roared into the fairgrounds on his Harley, protesters and members of the Service Employees International Union attempted to drown out his message. Meanwhile, the governor took the stage to point his finger at House Speaker Mike Madigan, saying he "picked a fight with the wrong guy." 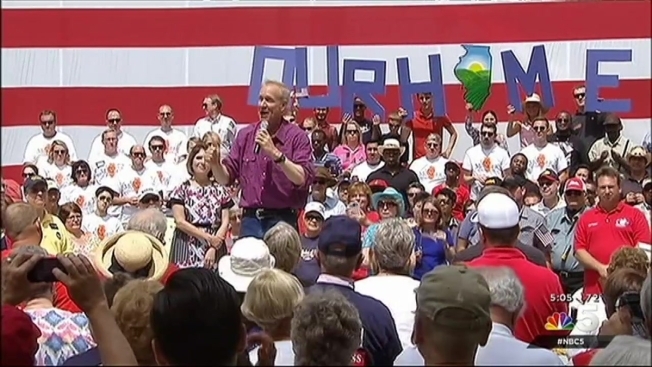 "Speaker Madigan, you know what, he's got ice water in his veins," Rauner said. "He's standing this route. He's refused to vote on a single one of the reforms." Madigan responded to the governor's comment today, saying the budget crisis is Rauner's fault, not his. Protesters argued that without a state budget, social service agencies are hurting. "We want him to know that Illinois cares, even if he doesn't," James Muhammad, a communications director for SEIU, said. "It's evident that he does not because of the things he is doing." State Democrats also attempted to drown out Rauner's message as they prepared to vote to override his veto of a measure that would ban a union strike or government lockout in the event of an impasse. Other Republicans celebrating "Governor's Day" at the state fair, however, sent a message of support for the governor. "People are saying, hang in there, don't let the Democrats win," House Minority Leader Jim Durkin said. "And that is a message I'm hearing from more than just Republicans."